Formed out of the ashes of Solitude. They were forced to change the name to Solitude Aeturnus. In late ’88 changes started to occur within the band and without going into too many details the members of the band all changed finally settling on a line up that consisted of Perez - still on guitars of course, Edgar Rivera - guitars, Robert Lowe - vocals, Lyle Steadham - bass and John “Wolf” Covington on drums. This line up would last for the next 7 years taking the band all the way to 1996. Of special interest is that Lyle Steadham actually joined the band on drums while Chris Hardin was still on bass. This particular line up recorded the second official demo of the band containing two classic tracks, “Mirror of Sorrow” and “Opaque Divinity”. Lyle would shortly move over to bass duties as Hardin left the band and Covington joined. This two song tape caught the attention of the independent label King Klassic. The band entered the prestigious Dallas Sound Lab in January of 1990 to record their classic debut album, “Into the Depths of Sorrow”. Xerox three panel covers. Originally released under Solitude. This version has a different cover featuring a castle. Studio tapes with stickers on the shell. Lyrics on back. Labeled as a demo but the band states it was an EP, but the demo thing stuck. 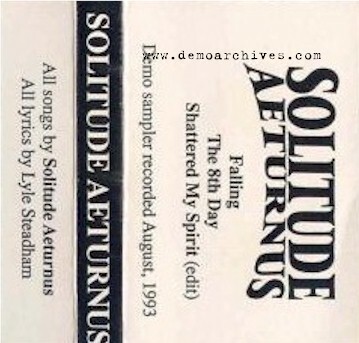 Solitude Aeturnus did a one song demo for the song Mirror of Sorrow that didnt have covers, it was mainly done for themselves. They combined this track with a demo recording of Opaque Divinity and issued it as a two song demo with a cover. Came with lyrics. Promo tracks for their CD.